America’s gun control debate is rife with myths and falsehoods. In the Information Age we often face a lot of misinformation, and gun control is unfortunately often the poster child of misinformation.Here are some of the ways you are being misled. The term “assault weapon” is a made-up political term. 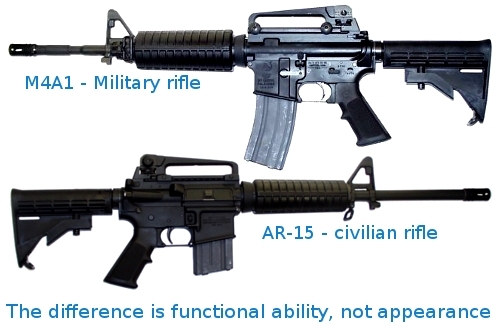 AR-15’s are not military rifles; so unscrupulous politicians refer to them as “military-style assault weapons.” ‘Style’ – as in cosmetic appearance – is the only true word in that description. The Military uses the M4A1 carbine rifle, which looks outwardly very much like an AR-15, but they do not have the same functionality; AR-15s are not machine guns, though the terminology used is meant to imply they are. Senator Diane Feinstein (R-Calif.) says AR-15’s are designed for killing as many people in close quarters combat as possible, when in fact the AR-15 is an intermediate to distance rifle with a range of 400-600m. Feinstein and others claim AR-15’s are not used for hunting; but in fact there are dozens of varieties of AR-15 used for hunting everything from varmint/small game to deer, elk, and dangerous game. The AR-15 is not the weapon of choice for most mass shooters according to James Alan Fox, a highly respected criminologist from Northeastern University in Boston; handguns are. In fact, rifle homicides comprise a very small amount of homicides, accounting for less than 3% of homicides (323 out of 12,664 in 2011) mass shootings or otherwise. 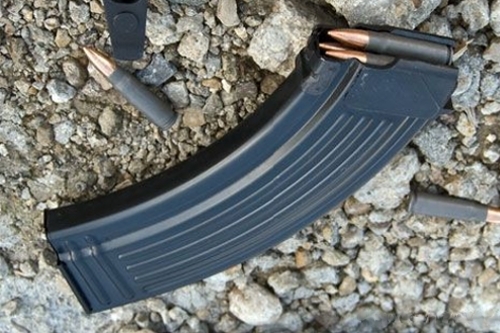 Some politicians would have us believe that so-called “high capacity” magazines are responsible for a wave of death sweeping the nation. Academic, scholarly research shows the vast majority of homicides average four shots with less than 10 shots fired. While the Aurora shooter infamously used a 100-round magazine drum, these are novelty items that are prone to jam. In fact, it did jam probably saving lives. But mass shooters don’t need 100-round magazines to commit atrocity – the shooters at Virginia Tech and Columbine used 10-round magazines, they just brought a lot of them (17 and 13 respectively). James Alan Fox states mass shooters often meticulously plan their attacks in advance; a high capacity magazine ban will not deter them as Virginia Tech and Columbine illustrate. Several people, including President Obama have stated that 40% of guns were bought via “gun show loopholes.” This is not true. For one, the term “gun show loophole” implies that people are deviously getting around something when in actuality; it is just selling personal private property and is not illegal or nefarious. 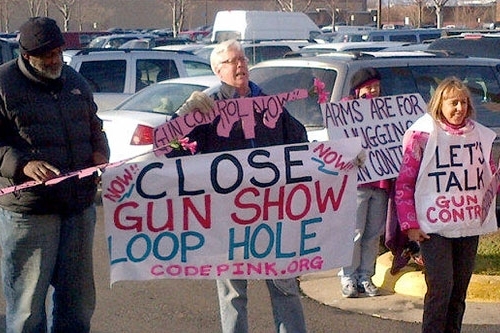 Additionally, private sales may not actually occur at a gun show at all. More important than loose terminology is that this claim is based on a study from 1994 of 251 people. The Washington Post evaluated this claim with the study’s original authors and says the president distorted the truth. The actual range is 14%-22% with a plus or minus error margin of 6%. This means the final accurate range of this study is as low as 8%, but no more than 28%; neither figure is 40%. Further, it’s implied that closing private sales would solve the issue of criminals obtaining guns; it doesn’t. It fails to address illegal trafficking and straw man purchases. A Department of Justice study indicates that 78.8% of criminals get guns from friends or family (39.6%) or from the street/illegally (39.2%). To this point, the FBI states there are 1.2 million gang members in U.S. and that gangs illegally traffic guns as addition to narcotics. Former President Bill Clinton,Mother Jones and others have claimed that mass shootings are increasing. Once again not true. James Alan Fox’s analysis of the Mother Jones‘ study indicates they left out mass murders which made it seem there was an increase after the Federal assault weapon ban expired (they’ve updated their story since). Some mass murders receive more media attention than others, however the number has been consistently about 20 annually since 1976. 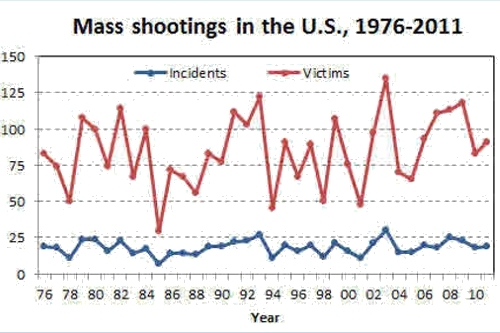 The number dead from these mass shootings fluctuates from about 25 to 150, depending on the year (Fox’s chart is shown above). In 2012, it was less than 100. Though tragic, this represents a fraction of 1% of homicides. 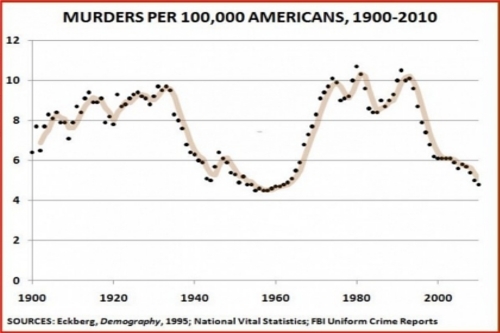 In recent years, homicides by raw number peaked in 1991 at 24,700; it’s dropped in half since, and the homicide rate per 100,000 people today is less than it was even in 1900 (see below). 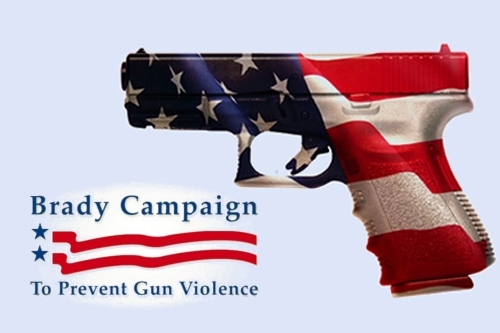 After a mass murder shooting anti-gun organizations like the Brady campaign inevitably call for gun restrictions; these organizations also cite gun violence data other than crime data to include suicides and injuries. This is misleading. Although accidents and suicide are public health concerns, it is disingenuous to include them with homicide in response to a horrific crime. According to the Center for Disease Control (CDC), suicide rates have crept up slightly 2000-2009, but are still lower than the rate per 100,000 from 1950-1990. It’s not accurate to say guns contribute to suicide causal factors since the rate is lower now. And ultimately, legislation aimed to prevent crime by banning weapons and limiting magazine capacity has no reasonable connection to either suicide or accidents. We ought to compare apples to apples: suicide with suicide prevention, accidents with safety programs, and homicide with policy that would realistically reduce homicide. This statement is political gaming and wordplay. How many dead would be okay? Who wouldn’t want less murder? Ideally, zero would be the goal, but that begs the question of how to prevent any tendency of violence in humans. This phrase is not only meaningless in terms of contributing to policy that achieves a positive end result, but also dangerous in that the appeal to emotion runs the risk of circumventing genuine solution in favor of sound byte. It makes sense to try to achieve goals with policies other than those proven to be ineffective, as the previous Federal assault weapons ban was. Lastly, homicides are at an all time low. 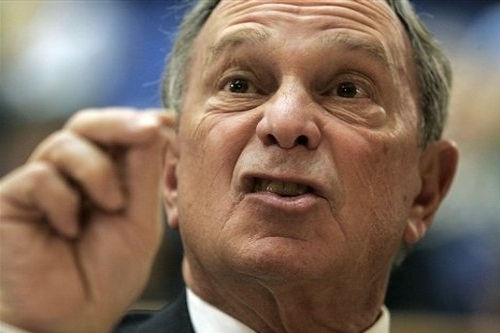 Famous anti-gun rights advocate New York City Mayor Michael Bloomberg said, “I want the Congress to have to stand up and say ‘I’m with the NRA and support killing our children’, or ‘No'” (Time magazine, January 28, 2013, p.30). On CNN’s Piers Morgan, Congressman Jerry Nadler (D-N.Y.) said, “the NRA is enablers of mass murder.” This overly simplistic incendiary rhetoric does nothing to further our national discussion, and falsely frames the debate as a zero-sum, winner-take-all, ‘either/or’ proposition – either you hug a gun or hug a kid, but you couldn’t possibly be for both gun rights and your child’s safety. That is preposterous. The NRA is not “the gun industry,” and preservation of the Second Amendment is not of interest only to gun manufacturers. Nearly half of NRA funding comes from individual donors. The NRA is comprised of average people who want safe neighborhoods, schools, and streets. Rather than offer ridiculous false dichotomy and grandstanding, we should be looking for genuine solutions. This is the granddaddy lie. We already have a lot of laws. It’s illegal to kill your mom, steal a gun, take that gun onto school property, forcibly break and enter, and murder kids. We already have laws preventing mentally ill & felons from obtaining guns, and we have a background check system (NICS). The Sandy Hook shooter was denied to legally purchase a gun because of the NICS system. We tried a federal assault weapons ban (AWB) before. What we do need is better enforcement of existing laws. Congress has not fully funded NICS. Many states do not fully report felony and mental health data to NICS. The Justice Department only prosecutes a fraction of those who criminally falsify background check forms. We desperately need to engage in genuine discussion about real solutions to the violence problem. These solutions are not likely to yield instantaneous results, or win the next election cycle; yet it is what we would do if we were serious about addressing the issue. The underlying causes include: gang activity, which accounts for 48-90% of violent crime depending on jurisdiction; drug abuse, the single biggest predictor of violence with-or-without mental illness; concentrated urban population and poverty; and mental illness, including de-institutionalization, treatment and intervention, and other facets of mental health. This article was originally published on PolicyMic.com, now Mic.com. Original publish date Feb 11, 2013. Original author, Matt MacBradaigh. Mass Shootings Are Responsible For Less than 100 Out of 12,000 Annual Homicides in the U.S.
To adequately evaluate this question, we should examine how many homicides there are in the U.S. overall, compared to homicides from firearms (handguns, rifles, shotguns), compared to homicides from rifles only (in which so-called “assault rifles” would fall), and homicides that occur in mass shootings. We ought to further compare homicides to other causes of death to get a comparative indication of the magnitude of each compared to other public health risks that cause death in the U.S. This will help us understand the relative significance of the issue. Total U.S. homicides: The total number of homicides in the U.S., reported by the FBI, is about 12,000-13,000 annually. Generally, this has trended downward since the early 1990s and 1980s, which saw several years with homicides ranging from 21,000-24,000 homicides. In 2010, the last year available, the number was 12,996. In 2009, it was 13,752. Firearm homicides: Out of the total homicides, about 2/3 are committed with firearms, 1/3 from other causes. We’ll look at both. In 2010, firearm homicides were 8,775, or 67.5% of all homicides. In 2009, the number was 9,199, or 66.8% of all homicides. Rifle homicides: The FBI reports the total number of rifle homicides is about 350 annually the last couple of years. This includes bolt-action rifles, as well as semi-automatic rifles and so-called “assault rifles.” There is a separate category for shotguns, so they are not included in this number. In 2010, the number of rifle homicides was 358, or 2.75% of all homicides. In 2009, the number was 351, or 2.55% of all homicides. Mass shooting homicides: Pop-media classification of “mass murder” varies. For instance, CNN’s Piers Morgan and The Nation cite shootings in which only 1 or 2 homicides occur. However, the FBI defines mass murder as 4 or more killed. In 2012, there were either 81 or 88 murdered in mass shootings, depending on your source. Less than 100 no matter, which source, is used. So if we assume high at 100 homicides from mass murder and assume low at 12,000 annual homicides that means that mass murders account for 0.0083 of all homicides, or a fraction of 1%. Personal weapon homicides: FBI data shows that “personal” weapon homicides, which is defined by hands/feet (beating someone to death) are 7-800 annually. In 2010, it was 745; in 2009, 817. This is more than double all rifle homicides. It is more than 7 or 8 times the number of mass murder homicides. Motor vehicle deaths: There are between 32-42,000 deaths from vehicle collisions every year. This dwarfs both homicides firearm homicides easily. When compared just to rifle homicides at ~ 350, motor vehicle deaths is massive & rifle homicides is minuscule. Unintentional injury deaths: The Center for Disease Control (CDC) reported 118,021 accidental deaths in 2009, the last year reported. Compared to this mass murder again appears relatively insignificant in terms of loss of life and public health concern. Accidental fall deaths: 2009 saw 24,792 accidental fall deaths. This accounts for 247 times the number of mass murder deaths. Choking: There are approximately 4,600 choking deaths every year. That’s 46 times the number of mass murder deaths. Children’s choking deaths number 1825, or more than 18 times the total number of mass murder deaths. Bambi: According to the Insurance Journal, 200 people were killed by hitting deer with their cars. That’s more than double the number of mass murder deaths. These cited statistics provide a mountain of data from credible sources that clearly provides a good comparison by which we can evaluate mass murder homicides within a complete picture of U.S. homicides as well as provide a means to compare homicides and mass murder to other causes of death that affect public health and safety concerns. When you evaluate the broader picture of public health causes of death, and even within homicides as its own category, mass murder looks pretty insignificant. Vote these idiots out of public office...!!! (D-CA-5th) and 113 of his Democrat colleagues submitted a letter urging President Obama to circumvent Congress by using executive action to expand background checks to cover private gun sales. The House Democrats’ push for executive action came on the same day that 24 Senate Democrats urged Obama to go around Congress and implement more gun control via executive action. The Senate action, which was headed by Sens. and Chris Murphy (D-CT), followed on the heels of Senator ’s (D-VA) calls for action following the August 26 on-air attack against a Virginia reporter and her cameraman. The August attack by gunman Vester Flanagan and the October 1 attack by a gunman at Umpqua Community College (UCC) both resulted in calls for executive action to expand background checks. However, such calls miss the larger fact that expanding background checks would not have stopped either attack, as Flanagan and the UCC gunman both passed background checks to acquire their firearms. The same is true of the July 23 attack at the Lafayette movie theater, the July 16 attack at Chattanooga military offices, and the June 17 attack at Emanuel African Methodist Episcopal Church in Charleston, South Carolina. The alleged gunmen in all of these instances passed background checks to acquire their firearms. So basically, we have 114 House Democrats and 24 Senate Democrats pushing gun control for gun control’s sake. The anti-gun attitude that permeates a great portion of our society didn’t happen overnight. It came about over many years as the result of subtle and not-so-subtle messages. The way to turn the tide is to counter this negativity with pro-gun messages. That’s why we have created two simple items that can help you communicate a pro-gun attitude as you do your shopping in the next few weeks and throughout the year. Anti-gun activists have spread no-gun signs throughout the country, preventing you from exercising lawful concealed carry in some of your favorite places of business. But now you can fight back with our Pro-Gun Decal. If you know of a business, including yours, that is pro-gun, give them one or more of these decals. They send a clear message to all law-abiding customers (and to criminals) that guns and gun owners are welcome. It is through small acts like this that we can start to change the attitude in America about guns. The decal is 3″ wide and 4″ tall, printed on a white background so it’s easy to read. The adhesive on the front allows you to place this decal on the inside glass of any door or window. It clearly states: LAWFUL CONCEALED CARRY PERMITTED ON THESE PREMISES. 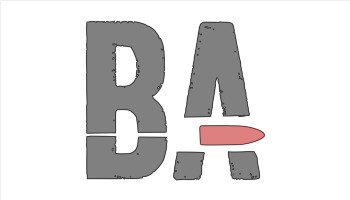 This decal is designed to work in any state that does in fact allow legal concealed carry. Many businesses have been duped into thinking that a no gun sign on their door will magically repel bad guys. In reality, the only people it repels are concealed carry license holders like YOU. Now you can inform business owners that they have lost your business by simply handing them one of our “No Guns No Money” cards. On the back, the card explains that a “no gun” sign is bad for business and actually invites bad guys. The decal and card are not money-makers for our organization. We price them to just cover our cost to print and mail them to anyone who wants them. Here’s what the card says: Your no gun sign prevents me from patronizing your business. So I, my family, and other gun owners will spend our money with your competitors. The decal and card are not money-makers for our organization. We price them to just cover our cost to print and mail them to anyone who wants them. The point is to distribute them as widely as possible to send a strong message that gun owners, especially those who carry concealed, are not to be feared, but welcomed. In an interview published Tuesday in GQ magazine, Mr. Obama said easy access to guns is “the only variable” between the U.S. and other developed countries. Following that shooting, the administration pushed Congress to enact tighter background checks on gun purchases, but the effort failed in the Senate. The interview was conducted in the White House, apparently sometime in October. Mr. Obama said in his seventh year in office, he feels “looser” and more confident. He said when he leaves office, he doesn’t want an appointment to the Supreme Court, but would be interested in becoming part owner of an NBA team or the league commissioner. The president revealed he has a virtual driving range in the White House to practice his golf swing, and said he hasn’t smoked a cigarette in five years. “I made a promise that once health care passed, I would never have a cigarette again. And I have not,” he said. SEATTLE, WASHINGTON — King County Sheriff John Urquhart is making sure that his county is as safe as possible and has been encouraging his deputies to carry their firearms even while off the clock. While his comments regarding concealed carry were focused on his deputies, Sheriff Urquhart was asked specifically about citizens with permits to carry, and whether or not they should carry as much as possible as well. He possibly, maybe, kinda hinted that citizens should indeed do the same thing. The typical canned response is to tell citizens to be a good witness, call police and let them handle it when they get there. Truth be told, the police usually aren’t there when you need them. It’s nice and refreshing to see someone in Urquhart’s position give it to us straight. And with that, we say Carry On. John Hendricks recalls a split second between impulse and action before he took aim and shot Everardo Custodio just before midnight on April 17 after Custodio opened fire on a group in Logan Square. Hendricks was not charged for shooting the 23-year-old because he had a concealed carry gun license and was determined to have acted in self-defense. But he said he was questioned for hours by detectives after the shooting and, seven months later, hasn't gotten his Springfield Armory .45 back from authorities. Still, the 48-year-old South Sider said he doesn't begrudge police for the glacial movement. "This is all new," Hendricks said, "because of the concealed carry." The 2013 passage of a concealed carry law in Illinois — the last state in the nation to approve one — has led to a relatively small yet recurring dynamic in Chicago shootings: the lawful gunman. Those with a concealed carry license who used their weapons have rarely spoken out about their experience. But in a Tribune exclusive, Hendricks recounted the chaotic minutes from the night he shot Custodio. Hendricks — an Army veteran, Uber driver, scuba diver and amateur photographer — is among 136,920 Illinoisans who had concealed carry licenses as of Nov. 3, according to state police. How many times these Illinoisans unholstered their guns and fired remains unclear, as state police say no mechanism exists to track such incidents. To be sure, they're nowhere near as frequent as those involving unlicensed shooters and illegal firearms. But a handful of high-profile shootings involving licensed concealed carriers since the law went into effect in January 2014 highlight this latest evolution in Chicago's relationship with guns. Reginald Gildersleeve was shot dead last month by a concealed carry gun holder after Gildersleeve tried to rob a Gage Park corner store, police said. A service member shot and wounded a gunman who opened fire on a group of people at a West Pullman party in July 2014. Later that month, a man attempted to help police foil an armed robbery at a south suburban Crestwood phone store by firing at the fleeing suspect. A police officer had to duck for cover when the unidentified license holder fired at the suspect. None of those shooters was charged. Illinois law says firearms can be used in cases of imminent danger and in defense of self and others. While political rhetoric continues to swirl around the issue, Hendricks said he sees his concealed carry license as a right, and a way to stay safe. "Living in Chicago, it used to be, 'don't go out at night,' or 'be more careful at night,'" he said. "It's turned into a place where it doesn't matter if it's day or night." On the night Hendricks unholstered his gun, he was taking a break between Uber fares and was parked in the 2900 block of North Milwaukee Avenue, just north of Central Park Avenue, according to his account and court records. He heard Custodio yelling to a group on Hendricks' side of the street and initially thought the man was shouting in a friendly, Friday-night fashion to his friends. Custodio started firing. Hendricks can't recall exactly how close he was. "Close enough to hear the sound of that gun, feel in danger and actually see him pulling the trigger," Hendricks recalled. "Close enough." He thought about speeding away. "I would've been driving right through gunfire," Hendricks said. "As you're thinking, time's ticking. Things are escalating. Things are getting worse. So at one point, you've got to make the best decision." He fired what police reports estimated to be about six shots at Custodio, striking the illegal gunman in the shin, thigh and stomach, according to court records. Custodio collapsed, his targets scattered and Hendricks sped to safety before calling 911. He later found a bullet hole near the lug nut of his rear driver's-side tire. Police responded to the scene after hearing the gunfire and found Custodio lying on the sidewalk with multiple gunshot wounds, surrounded by shell casings, according to a police report. A "blue steel firearm" was recovered by evidence technicians about 15 feet from where Custodio was taken into custody, according to court records. He pleaded guilty in August to charges of aggravated discharge of a firearm and aggravated unlawful use of a weapon, receiving concurrent sentences of four years and three years, respectively, according to Cook County state's attorney's office spokeswoman Sally Daly. Hendricks returned to the scene when police arrived and held his arms in the air, concealed carry and firearm owner identification cards in hand. He said it was a common-sense approach after what had transpired. "A shooting just happened," Hendricks said. "I'm the one that called, and I'm the shooter." "At the time, I remembered I still had my firearm on me," he recalled. "I let them know that my firearm's on my right side." Police disarmed and questioned Hendricks at the scene before more questioning at a police station that stretched through the night. He said he was treated well but wished detectives had let him order a pizza. "You had just went through something that was tremendous, and something new, so there's a moment that you know there's going to be a long process," Hendricks said. Police have yet to return his firearm and are not returning his calls, he said. Police spokesman Anthony Guglielmi said an investigation into the gun was ongoing and that he did not know when it would be complete. He declined to comment on the specifics but said such investigations can include ballistic testing, trace comparison and other means of finding out if a firearm was involved in other incidents. Police representatives said this week that a Tribune open records request filed Oct. 27 for the entire case record was still pending. At the time of the shooting, Uber policy mandated that its contractors abide by local laws. Uber later banned gun possession by passengers and drivers, according to company representatives. Hendricks said he remains an eligible driver but hasn't done work for Uber in a few months. He doesn't consider himself a hero, just someone who was able to stop a threat to his safety. He said he never spoke to Custodio's targets after the shooting. "There was a threat to me and I helped somebody in the process as well," Hendricks said. "It's a positive feeling." But Hendricks said first and foremost, he had wanted to get away from Custodio's gunfire. "The last resort is to stop a threat or end a threat," he said. "When people say things happen fast — it does. You either rely on your training or you rely on your instinct. Everything becomes more reliable. Your training, your instincts, your gut. Everything." Charles Houston said his friendship with Hendricks is the type in which they don't speak for long periods, but then pick up right where they left off. The 53-year-old information technology specialist met Hendricks when they both lived in South Chicago, and Hendricks asked Houston to teach him martial arts. Houston said he was "pretty shocked" when Hendricks told him about the shooting. "I understand the stress it put him under," Houston said. "He was pretty shook up by the whole thing." Houston said the incident falls in line with his friend's character: Hendricks, he said, is protective of himself and others. While he doesn't question his friend's reaction to the shooter, Houston said he is generally against concealed carry in Illinois. "We're not on the same page with that," he said. Houston said he's fine with gun carriers in some areas but that it doesn't work everywhere — certainly not in Chicago. He recalled living just outside Phoenix for years. There, he said, gun carrying was common, and it wasn't problematic. "The problem is everyone who has ill intent," he said. "And there is an overwhelming number in Chicago that do. ... Too many illegal guns and too much ill intent." It's a perilous combination to have concealed carriers side by side with illegal gun toters, Houston said. Still, he's glad his friend had his gun that night. He has tried to be there for Hendricks since it happened. "I don't think that's something you can easily forget," Houston said. "I wish it hadn't happened at all." Hendricks said he was formally trained to handle firearms while in the Army but that he also grew up around guns. He recalled his dad taking him to shoot while on family vacations in Arkansas, where he first learned to be safe and respectful around guns. He said the 16 hours of training required to receive an Illinois concealed carry license are "very, very good." "I'm a strong advocate of training," Hendricks said. "Training, training, training." He said he owns "quite a few" guns and has several holsters and fanny packs for when he's out in public. During a recent interview, the gun on Hendricks' hip was not apparent until he pointed it out. "You're not always conscious of carrying," he said, just like you aren't always conscious of carrying a wallet. Hendricks said he's a stickler for the concealed carry rules — even when they aren't convenient. He has gotten used to turning back when he sees a "no gun" sign on a Chicago storefront. Once, he said, he stopped short outside a University Village Quizno's. An employee out front was sweeping. Hendricks told the employee he had a gun on him and the employee said to go in anyway. But Hendricks said he wouldn't. "It says 'law-abiding' for a reason," he said of the concealed carry law. "I'm going to abide." Shoppers at the Mall of America need to be “particularly careful” after a terror group singled out the Minnesota super-mall for attacks, Homeland Security Secretary Jeh Johnson says. During an interview Sunday with CNN “State of the Union” host Gloria Borger, he cautioned shoppers who plan to visit the mall that Al-Shabaab included on a list of targets in a video released this weekend. Counter-terrorism experts have long expected an attack on soft targets in the United States. It’s simply a matter of where and when and how bad it is going to be before the terrorists are wiped out. We have the ability—and I would argue, the responsibility—to make such an attack as difficult as possible. 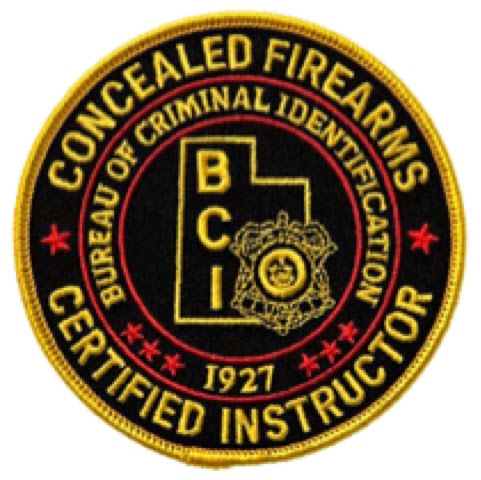 There are more than 11 million concealed carriers in the United States, but only a very small percentage of concealed carriers carry a significant portion of the time. Typically, concealed carriers leave their handguns in their gun safes until they anticipate going somewhere out of there normal “safe” areas, or out at night. As we now live under the increased threat of Islamic domestic terrorism, it is my belief that more citizens should get quality handgun training and obtain their concealed carry permits. 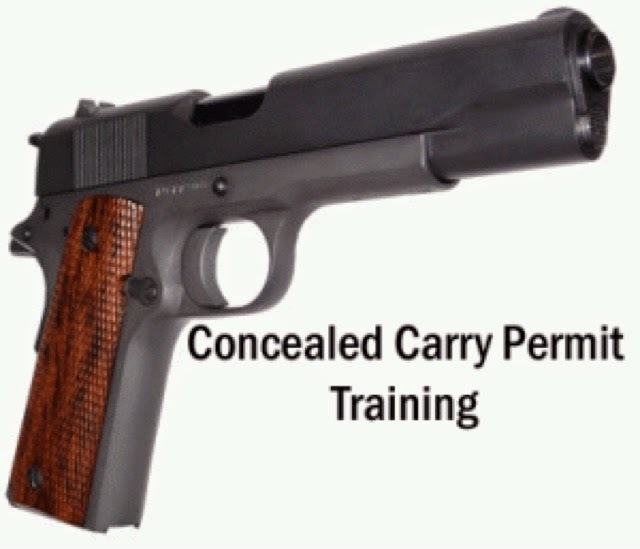 Concealed carriers who already have their permits should begin carrying with more regularity, and may want to consider upgrading what they carry on a daily basis. I upgraded my everyday carry from a “pocket nine”to a more capable configuration. I’ve added a M18 Maverick Olight, and swapped out the single-stack Kahr with one spare magazine for a Walther PPQ 5” with two spare double-column magazines. The pistol and magazines are carried concealed under a winter coat. In my case, I decided that the Kahr 9mm that I’d been carrying simply wasn’t enough gun. While it might be effective against a lone mugger inside seven yards, I wanted to have a firearm with a greater sight radius and a higher magazine capacity, a handgun that I felt confident that I could make hits with out to 25 or 35 yards (from prone). I already had the Walther PPQ that I became very familiar with in my Gunsite 250 Pistol course, so my upgrade was simply a matter of choosing to walk out of the house with a different handgun. I’ve also started carrying a second spare magazine, and added a quality lightweight flashlight to my everyday carry. While I’ve never been fast in terms of raw speed, I’ve always had quick reflexes. In this still photo taken at Gunsite Academy, I’m already down on one knee and transitioning to prone before the rest of the firing line. Do I have any illusions that I’d be well equipped to take on and defeat a team of Islamic terrorists armed with rifles or shotguns and IEDs if I’m armed with just a handgun? No, I don’t. But I do think that I stand a slightly better chance of making their day a little more difficult. If they run into a couple of concealed carriers, off-duty law enforcement officers, and the armed police patrols in and near so many malls these days, time can be bought for families to escape. Al Shabaab wants to create another Westgate Mall Attack. I’m hoping that if such an attack does happen, that another hero like the off-duty SAS officer with a handgun will emerge to save lives that might otherwise be lost. The terrorists have made their intentions quite clear. You have the choice of gambling that it won’t affect you—and you’ll probably be right—but I’ve never been much of a gambler. Is concealed carry a lifestyle? Should you carry a gun at home? 10 things concealed carriers should never do!!! Conceal carry options for a skinny guy!